University of Brighton law students, Fionnuala Richardson and Chloe Chatton continued to ask the right questions as their outstanding performance gave them victory by an overwhelming clear margin in the National Law Society Client Interviewing Competition in Sheffield on Saturday. The University of Brighton pair had high hopes to continue their winning streak as they went into the final, held at the offices of one of the UK’s largest law firms, Irwin Mitchell LLP, against fellow regional heat winners, the universities of East Anglia, Gloucestershire, Hull, Kent, Manchester Met, Oxford Brookes and University of Law (Leeds). The finalists fought hard for the final honour but it was Fionnuala and Chloe who used their well honed legal knowledge and interviewing skills to get through three difficult and differing client interviewing scenarios on a range of complex family law interviews. The pair was once again judged victorious and the panel made up of legal academics, medical practitioners and practicing solicitors awarded the University of Brighton team first place by a clear margin. Fionnuala and Chloe and the University of Brighton Law School were subsequently awarded prizes from the Law Society of England & Wales, which included the prestigious National Law Society Client Interviewing Competition cup, individual trophies for Fionnuala and Chloe, and sponsorship funding for the International Finals. 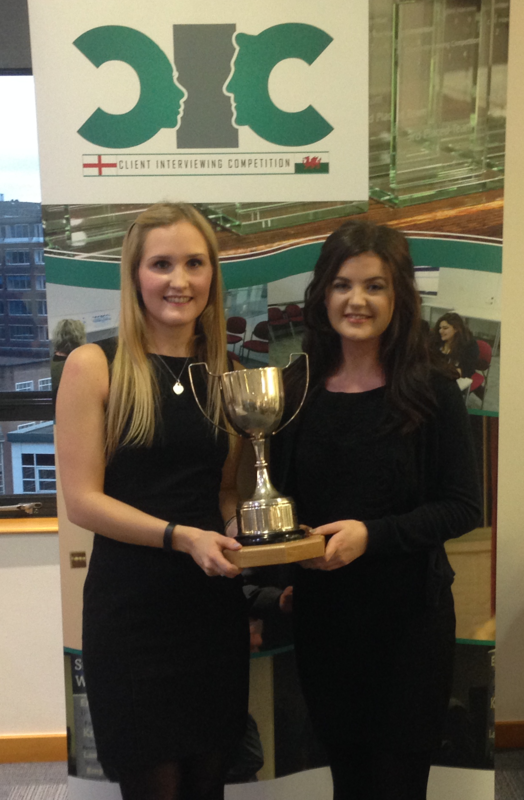 The winning team Fionnuala Richardson and Chloe Chatton proudly show off the National Law Society Client Interviewing Competition cup. Fionnuala and Chloe’s journey to success in The Law Society’s prestigious competition has seen them compete against universities from across the country for the national final and the esteemed honour of representing England & Wales in the International Client Consultation Competition Final at the University of Windsor in Canada in April. Good luck Fionnuala and Chloe!